Nagoya TV Tower, c. 1955. 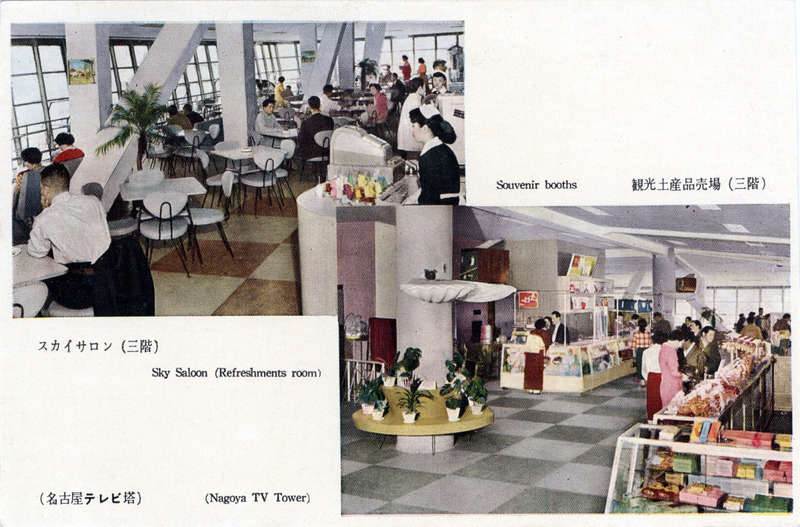 NHK, the national government television broadcaster, had studios in the lower observation level, the Sky Terminal. 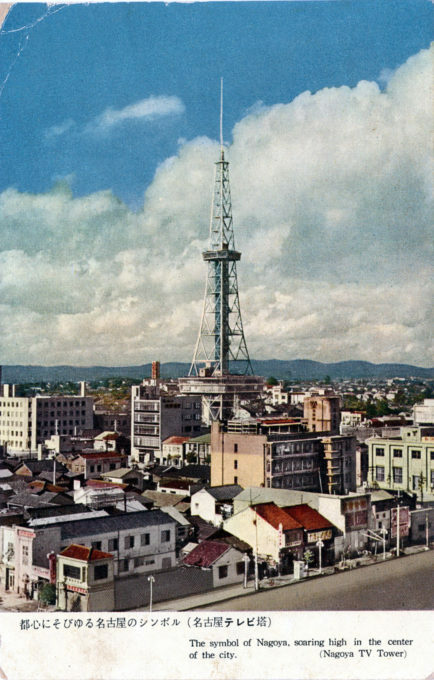 From the wiki: “Nagoya TV Tower is the first and oldest TV tower in Japan, and was completed in 1954. It is located in the centre of Hisaya Ōdori Park. The tower is 180 metres high, and has two main observation decks at the heights of 90 metres (the indoor Sky Deck) and 100 metres (the outdoor Sky Balcony). The tower also includes a restaurant and gallery at 30 metres. Nagoya TV Tower closely resembles the Eiffel Tower. 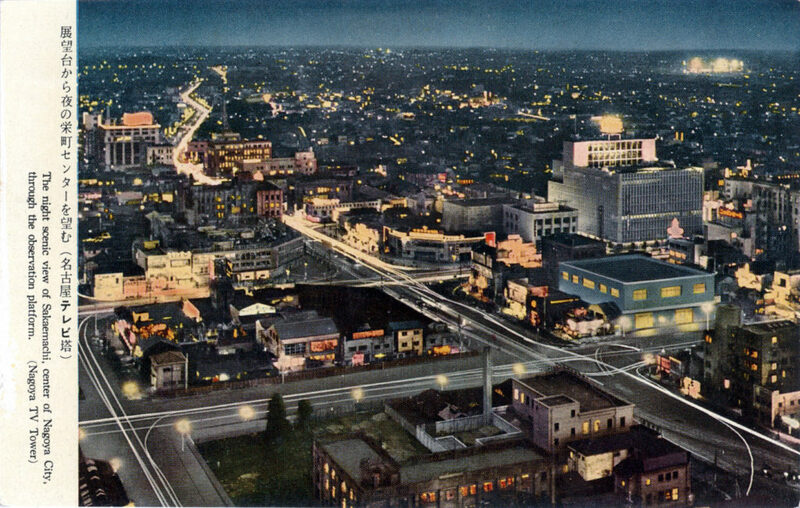 Tashu Naito, the architect, would go on to design Beppu Tower (1957), Sapporo TV Tower (1957), and Tokyo Tower (1958). “The famous movie monster, Godzilla, pulled the tower down in Mothra vs. Godzilla (1964), and twenty-eight years later, it was destroyed again in the 1992 remake, Godzilla vs. Mothra. This time around, it is demolished by the monster Battra, when the creature attacks Nagoya. 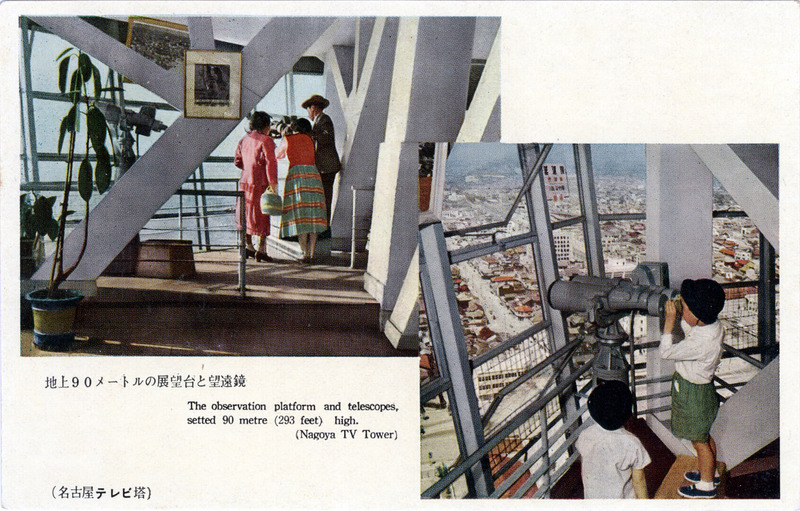 Nagoya TV Tower, daytime, c. 1955. 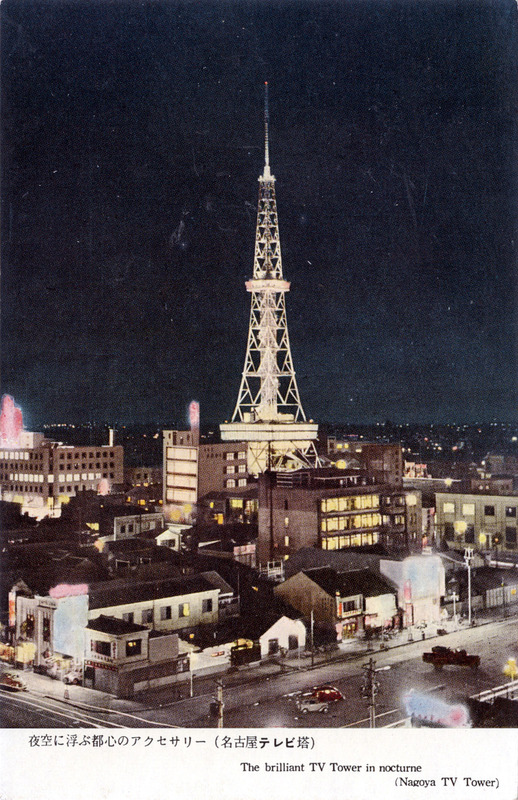 Nagoya TV Tower, nighttime, c. 1955. Sky Deck (90m) interior, c. 1955. 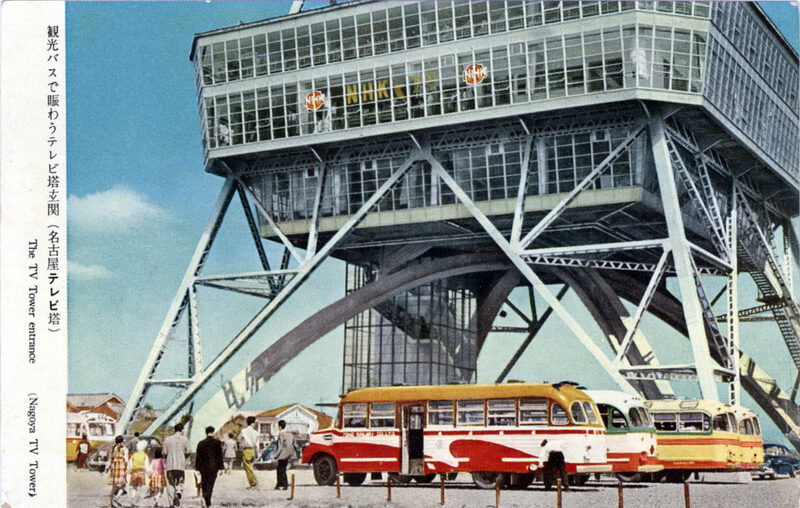 Nagoya TV Tower, c. 1955. A view of the city from the Sky Balconey. 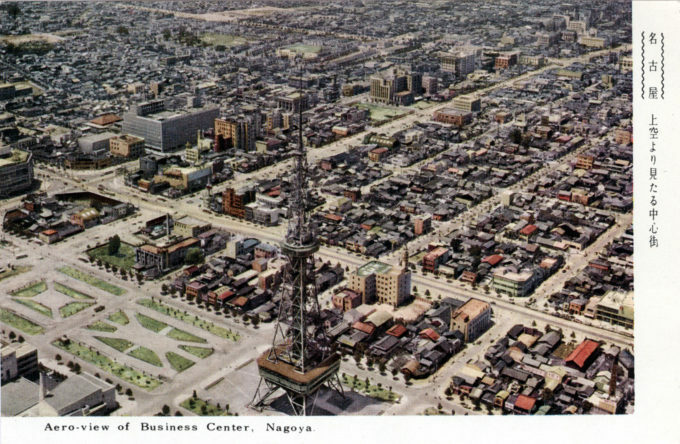 Aerial view of Nagoya’s business center, c. 1960, including Nagoya TV Tower, fifteen years after 90% of the city was leveled by wartime firebombing.